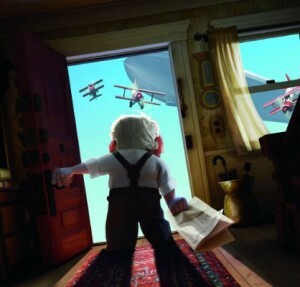 Up - Movie Review - Pixar Continues To Soar - Are You Screening? Long ago I mentioned that Pixar has a curious ability to make movies I find wonderful, but virtually no ability to get me excited for them. That hasn’t changed. Sure, now I’m just generally moved to anticipation because Pixar hasn’t really ever put together a movie I couldn’t stand, but it doesn’t go much past that. I mean, old guy’s house floats away on balloons sure, but what do I really know about the film? Up begins with a young, and thoroughly goofy boy named Carl watching a theatrical newsreel circa… long ago days when there were theatrical newsreels. He’s watching footage of his hero Charles Muntz, super-explorer extraordinaire. Little Carl is enthralled. Heck, he’s already got his own goggles just like Muntz wears when he’s flying around the world in his giant zeppelin. But wait! It seems Muntz has been called out on his latest specimen! A skeleton he declares is the Beast of Paradise Falls, which he brought back from his trip to South America is coming under serious scrutiny! Scientists believe Muntz faked the skeleton! Muntz is stripped of his… whatever! But wait again! Muntz vows to return to Paradise Falls, and he won’t come back until he brings the Beast with him! Unperturbed, young Carl “explores” his neighborhood, remaining true to his hero. He finds Muntz’ number one fan, Elie, playing in an abandoned house, and is so agog to discover that he isn’t himself Muntz’ number one fan he can hardly speak. 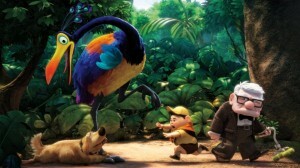 Carl tries to make good, but Elie becomes ill, and passes away before they have a chance to see Paradise Falls for themselves. When the forces that be conspire to remove Carl from the home which he holds onto as tightly as any other reminder of Elie, he decides to go for broke. He may putter around his aging home chatting with his dead wife, but he’s got a lot of helium, and by God, he knows how to use it. 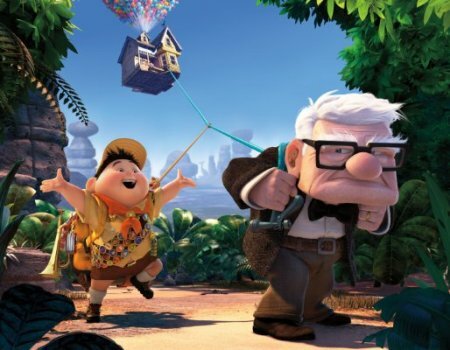 During the expedition, Carl is going to discover that he’s got a stowaway named Russell, who’s as much of a goof as Carl was at that tender age, though Russell aims his adventure-happy goofiness at Boy Scout knockoff Wilderness Explorers, or whatever it is. When we get to South America we also add a giant bird and a talking dog, and Carl is able to pinpoint his quest to the hauling of the house to a certain spot… but none of it matters a bit. There’s a lot that’s fun and funny throughout the course of our adventure, there’s even some adventure, but all along we wonder about Carl, and what it is he’s doing. In the end, two really old men look back at their lives… not with regret, and not really even trying to make sense of it all, but with a certain youthful bewilderment that says, “What the hell was that?” Carl finds something, and he didn’t even know he was looking for anything… though, of course, we did. That might sound strange considering he finds a new-era version of himself, a talking dog, his long lost hero, and an undiscovered species of bird… but, he doesn’t find any of those anyway. The funny thing about life is that you somehow don’t quite feel right unless you’ve got a “dream,” but no one quite has them worked out. “Going to Paradise Falls together,” is a nice dream, and a worthy placeholder for whatever dream you want to fill in, but the trick is that it only has two relevant words in it. As I’ve said before, and as every child knows, dreams do not “come to fruition.” The dream’s the thing. There are a lot of technical things you can say about Up (and I think they’d all be positive), but bothering to mention them seems to me like finishing Les Miserables, and talking about sentence structure and verb choice. There are those who will say such things, and good luck to them. For me, those people feel the pull of the dream, have probably even affixed some manner of reference to it… but, they’re dreaming it wrong.